Lentil soups are great this time of year when the season is lean, and fresh local produce consists mostly of tubers and squash. Lentils are extremely economical. Added bonuses: they cook up quickly, and have a wholesome, delicious nuttiness. This soup is adapted from one in the Dean and Deluca Cookbook. If you keep the spices and lentils on hand, you can quickly pull it together after school or work. Start to finish, the soup should take you about 30 minutes to make. Actually, it will take you about 20 minutes (I added an extra 10 minutes for you to enjoy a glass of wine). 1. In a large Dutch oven, melt together the butter and the olive oil over medium heat. Add the onion and cook it until it begins to turn translucent. Add the spices to the onions, stirring frequently to make sure that the spices toast, but do not burn. Continue to cook the onion until it begins to turn golden. 2. Toss the lentils with the onions and the spices. Add the stock, the extra cup of water, and a heavy pinch of salt. Bring everything to a boil, and then reduce the heat to a simmer. Simmer the lentils until they are tender, about 15 to 20 minutes. Once the lentils are tender, add the lemon zest and half of the yogurt to the soup. Continue to simmer everything together until the consistency is nice and smooth. Adjust the seasoning. 3. In a small bowl, combine the remaining yogurt with the lemon juice and the parsley. Stir everything together until the consistency is smooth and silky. 4. Ladle the soup into bowls. Top each serving with a swirl of the yogurt mixture and a sprinkle of Aleppo pepper. Thanks for the comment! Why not both? For a long time the Dean & Deluca cookbook was my favourite cookbook. Lovely recipes, meticulously tested, and so diverse! This soup is one of my fave quickie soups, and I like that you’ve added in the time for the wine at the end (very important). It was one of the first cookbooks I bought as an “adult,” and remains one of the ones I thumb through the most! PS. If you’re in London, you should (if you haven’t yet) check out my friend’s new restaurant in Soho: Pitt Cue Co. ! The spices listed in the recipe sound so fabulous and tasty. 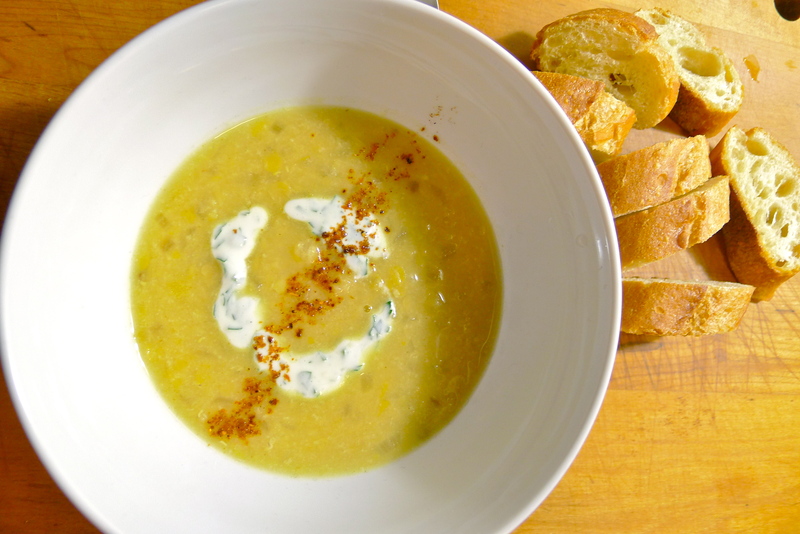 Now that winter is in full swing I love quick and thrifty soup recipes! I know! And January is supposedly National Soup Month. I’m not sure who decides these things, but there you go! I went to the supermarket yesterday and looked for red lentils but didn’t find anything. Are they a specialty item? I’ve never worked with them before. We live in semi rural Maine so there’s not a great selection at the grocery store. Hmmm. Sometimes they have lentils in the ethnic food section. I think I’ve seen Goya packs of them. Otherwise, is there a health food store in town? They will have them for sure! Thanks! The D&D cookbook is great. I learn so much from it, and those are the best kinds of cookbooks.